One of the most exciting times in a child's life is when they are beginning to unlock the mysteries of the written word. We are just starting to get there with my son. He'll be five soon and has been working his way through our kindergarten curriculum. He's beginning to find -- and read! -- words everywhere! From street signs to grocery store advertisements to picture books to song lyrics. He is beginning both to recognize familiar words and to sound out new-to-him words! I know it won't be long before he develops into a fluent and avid reader, just like his big sister, and just like me! Because Little Guy will soon be reading on his own, I wanted to get him a Bible, God's Holy Word, of his own. Although it is somewhat more difficult than a children's translation, Hubby suggested we get the NKJV for Little Guy since that is what he uses. Like father like son, right? 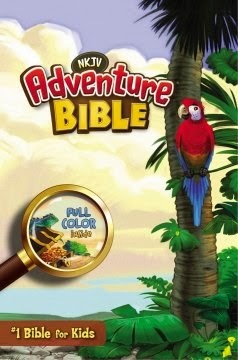 I was very pleased when I received a free copy of the NKJV Adventures Bible from Zondervan. From the dot-dot-dot path prints to the X-marks-the-spot symbols, from the bright red parrots and poison green frogs, there is color on every page bringing additional information and insights. This Bible is FUN to look at! It evokes a piratey adventure journey complete with chests piled with gold coins (I mean, Words to Treasure) that is both pleasing to the eye and exciting for young children -- boys in particular. The Adventure Bible would be perfect for boys of any age -- from the emerging reader (hey, they grow and learn fast!) to the intrepid early teen embarking on a new phase of life. Even my kindergartener is enjoying thumbing through the pages, spying out maps and charts, looking for words he knows, and asking someone older than him to read Scripture to him from it. Best of all, when Daddy reads aloud from his Bible, the little tyke can follow along with his own text because the words are the same! Although he can't read on his own yet, Little Guy can't wait to carry his new Bible to church with him this week!